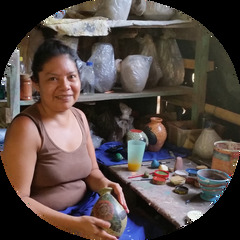 Working with the fair trade organization Esperanza en Accion, men and women artisans in Nicaragua produce traditional pottery pieces that are world renowned. While they started with two artisans, they have expanded to working with more than 31 different groups of artisans. Esperanza en Acción is committed to working with artisans living in poverty, whether they are organized in cooperatives, collectives or work in their homes with their families. Artisans in San Juan de Oriente make the pottery using a manual kick wheel and finish the pieces using natural mineral oxides for the earthen colors. The fantastic flora and fauna of Nicaragua are the basis for stunning vase designs and novel wind instruments. The pottery is fired using a low-temperature technique so the vases are decorative as they do not hold water. To empower people in the ‘First World’ to transform our global economic system into one that is fair for ALL people. Esperanza en Acción's commitment is to buy directly from the artisans and pay a fair price for their work, thus empowering them to cover basic needs including food, shelter, education, and health care for their families. We desire to establish long-term relationships with these producers and promote their talents in a way that preserves their cultural identity. We strive to educate consumers about the often hidden human costs of our "bargains." By providing information about producers' history, culture and living conditions, we hope to enhance cross-cultural understanding and respect between consumers and communities in the developing world. ~adapted from the Fair Trade Federation Our Principles and Practices Esperanza en Acción includes the following ethical principles and practices in our trade relationships (from the Fair Trade Federation): paying fair wages in the local context consumer education equal employment opportunities for all people, particularly the least advantaged financial and technical support whenever possible encouraging cooperative workplaces building long-term trade relationships respect for cultural identity healthy and safe working conditions within the local context environmental sustainability In practice this means that Esperanza en Acción always pays artisans 50% upfront for any orders made with them, giving them the opportunity to purchase materials and support themselves during the production of our order. In addition we are in constant contact with the artisans, visiting their homes, families and locations of production in order to know their strengths and where we can provide technical assistance to help them improve their work. We also conduct an economic evaluation of the process of production of the artwork to help the artisans determine a fair price for their pieces using a formula based on local, national and global indicators to calculate a fair wage. This ensures that the price we pay to each artisan for their artwork is a fair one.